Appealing to both adults and young people, Japanese Manga is the most popular form of comic art today.Manga Mutiny is a Biblically-accurate retelling of Genesis through Exodus 15:27 presented in the authentic Japanese Manga style. This book, third in the Tyndale Manga series, combines cutting-edge illustration with fast-paced storytelling to deliver Biblical truths in a compelling package to an ever changing, post-modern culture. 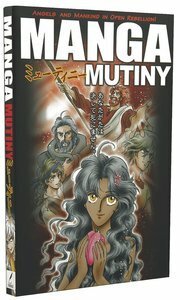 About "Mutiny: Angels and Mankind in Open Rebellion (#03 in Manga Books For Teens Series)"
MANGA (pronounced "mahn-ga") is the Japanese word for comics. Appealing to kids and adults, readers will find this edgy rendition of the Gospel accounts both compelling and highly engaging. This authentic, cutting-edge art style is combined with fast-paced storytelling to deliver biblical truths to an ever-changing culture that is often a challenge to penetrate. This is genuine Japanese manga style, unlike other Christian "manga" books in the marketplace. A great way to introduce anyone to the Bible! Appealing to both kids and adults, Japanese "manga" is the most popular form of comic art today. Now, Kelly Shinozawa brings genuine cutting-edge manga style to the New Testament story of the early church . Scriptural authenticity combines with fast-paced visual storytelling in this compelling graphic novel!